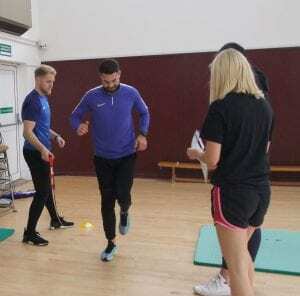 PGCE and School Direct Physical Education trainee teachers were provided with an alternative approach to the teaching and learning of athletic activities. Activities specifically for indoor teaching focused on running at maximum speed over short distances and running over obstacles. Trainees learnt to teach jumping events using the basic skills of hopping, leaping, springing, skipping and bounding, and also throwing events that involved throwing balls, quoits, foam javelins, shuttlecocks, bean bags or hoops with pushing, pulling, swinging, slinging and heaving actions. Typically, the teaching and learning of athletics in secondary schools takes place in terms five and six of the academic year (April–July). This can be a time when the weather in the UK can be particularly unpredictable and physical education teachers often have to adapt and modify outdoor lessons for an indoor environment such as a sports hall or gymnasium. Physical education teachers have to be creative with respect to the physical resources at their disposal and have to design schemes of work ensuring that all pupils are included and have a positive learning experience in track and field athletics. PGCE and School Direct PE route leader Dr Gary Stidder said: “Athletics activities should be taught developmentally across all four key stages of compulsory education. “The aim of teaching indoor athletics is to link basic fundamental movements to the general principals of running, jumping and throwing and then to introduce modified and adapted events at the secondary school stage. This provides the foundations and scaffolding before pupils are taught specific performance-related events.